Treatments for mental illness during pregnancy or after your baby is born may be a bit different to treatments for other adults with mental illness. When treating you at this time, doctors have to consider the needs and safety of your baby, during your pregnancy and while you're breastfeeding. Both you and your baby will be affected by treatments, so both your needs must be considered. You might start medications sooner if you have a newborn baby. This is because the effect of an untreated mental illness can cause long-term harm to your child’s development. On the other hand, if you have a mild mental illness, you might decide to avoid medications to reduce your baby's exposure to them. This would be after discussions with your doctor, and if it looks like non-medication options might work. This online programme is based on cognitive behavioural therapy, one of the most common treatments for anxiety or depression. You'll need to be referred by your GP to take part in this programme. On this page you'll find several different modules designed to help manage anxiety and depression. Mindful Motherhood is an online course from the USA that provides introductory mindfulness training for pregnant women and new mothers. The registration costs listed on the site are in US dollars. A range of online courses to improve mental wellbeing. Some introductory courses are free but most courses cost around A$65. Your GP must first register as a prescriber. They can then email a prescription to you, so you can register for a course. You can learn more about mindfulness meditation on the Australian site Smiling Mind (it has a free app) or the American site Headspace (it also has a free app, for an introductory 10-day programme). Talking therapy helps to different degrees, depending on the mental illness. 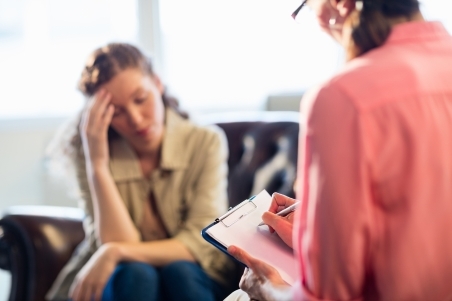 For information about talking therapy for various mental illnesses, see Anxiety disorder treatments and Treatment options for depression. Your GP should be able to recommend a therapist whose charges you can afford, or refer you for some free counselling. Medications are available to treat mental illness, and many are safe to be used both during and after pregnancy. Leaving more serious depression and anxiety untreated could cause more harm to your baby than taking a medication. Your doctor will be able to talk to you about the risks and benefits of medication. If you're already taking medication and are thinking of becoming pregnant, it's a good idea to talk to your doctor to make sure that no adjustments need to be made. You can find advice about medication use in pregnancy on the UK site bumps (best use of medicines in pregnancy). You can also find out more about the particular medicines you are taking in Medications for mental health issues. This American website has factsheets about the effects on your baby from: common medications, herbal products, infections and vaccines, medical conditions, smoking and illegal drugs, alcohol, and other substances.